In the video on this page, expert and Osteopath Tim Judd explains the triggers to shoulder problems, how the shoulders function and the reasons for discomfort and pain. Now that you understand what causes shoulder problems and how to prevent the most common shoulder problems, it is time for targeted exercise to improve the range of motion. Click here for a sample of just one of the 16 Shoulder Stretches available to you. For immediate relief of shoulder pain, tension, or shoulder stiffness and fatigue, go here for Essential Shoulder Exercises that can relieve stiffness and discomfort, or add to cart now. 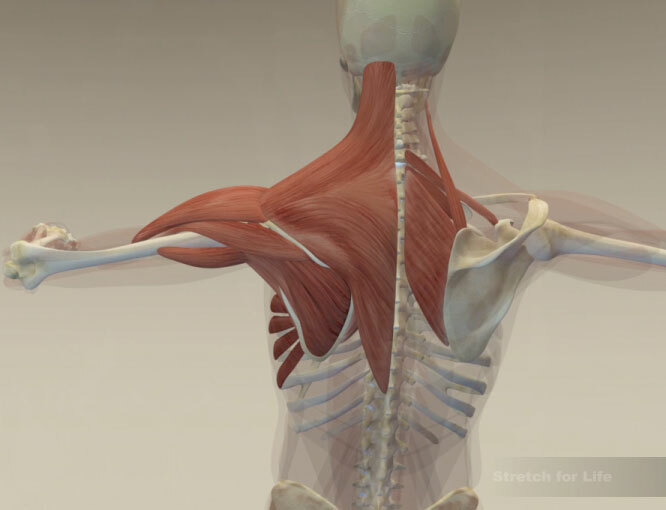 Learn about shoulder and joint pain relief through medical anatomy and 3D animation. What causes chronic shoulder problems? What are the most common shoulder conditions? What is the relationship between your shoulders, neck and back. Shoulder blade pain is the most common shoulder problem. If you have ever had that intense pain between your shoulder blades then it is highly probable that your shoulders are dragging forward too much and is a classic sign that you need to get balance in your shoulders. An intense pain on the inside of your shoulder blades indicates your shoulders are too far forward and the muscles at the back just can’t cope with the strain any longer as they try to prevent the shoulders dropping off the front. This results in pain and inflammation. You need to correct the muscle imbalance and stop the tug of war between the muscles on the front of the shoulder and the muscles on the back. In short, the back muscles are sore and painful because the front muscles are too tight. When the big pectoral muscle goes into spasm you can get tightness and pain in your chest and pins and needles radiating down your arm symptoms which can mimic a heart attack. Stretch for Life will give you guidance to improve your physical health through good management and living. At times the use of medications such as anti-inflammatory’s, supplements, vitamins and minerals can aid in recovery and improved range of motion. Two other common conditions that befall the shoulder is supraspinatis tendonitis and frozen shoulder. The supraspinatis muscle is one of the rotator cuff group. 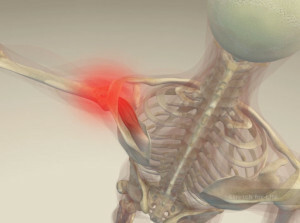 Supraspinatis tendonitis is when it is painful on the tip of the shoulder. This becomes really aggravated and restricts movement in your shoulder. (For example, when you raise your arm out to the side and more so if you rotate your arm backwards when you brush your hair or scratch the back of your head.) This muscle comes off the top of the shoulder blade, descends down through a bony tunnel, attaches to the top of the arm bone and brings the arm out to the side. If this muscle becomes inflamed it will swell. Inside the confined space of the tunnel it becomes even more irritated and more inflamed. Being in an environment with a poor blood supply also diminishes the body’s ability to heal itself. Frozen shoulder is when the whole shoulder seems to have completely seized up making any movement very painful. Generally, Frozen Shoulder is a build up in tension in the whole of the upper back, neck and shoulders and this accumulation culminates in one of the shoulders having a meltdown, sometimes very quickly. It is a very difficult condition to treat. The typical pattern of the frozen shoulder is the first stage becoming increasingly painful and dysfunctional, then staying in this state before slowly coming right in the third stage. No matter what the treatment sometimes you have to go through the body’s own process. Unfortunately this can be up to three years, a year in each stage. So prevention through upper back and shoulder maintenance is by far the better approach. An understanding of good posture will also help. Throughout this website you will find treatment options and guidance to better health and living through exercise, fitness and nutrition. Because most of our activities are forward, anything that accentuates that position or holds us forward for extended periods of time will really put a lot of strain on the muscles across the back of our shoulders. There may be inherited tendencies like an increased spinal curvature or heavy breast tissue, or poor work habits. One of the most common causes of this presentation is an incorrect gym routine where the focus is on one group of muscles at the expense of another. Try giving each group of muscles equal attention. There are many options to prevent pinched nerves, increase your range of motion and reduce muscle strain. Strengthening is the other important issue for good shoulder function. Even a small increase in shoulder muscle strength can make a huge difference in your ability to maintain good posture and perform daily activities with ease. It also reduces vulnerability to injury when you exceed what you would normally be doing. So the key with the shoulders is stretching the muscles on the front of the shoulders to maintain muscle balance and strengthening the muscles on the back to help pull the shoulders back. Care is needed not to overdo it. Osteopathic treatments are often required to sort out the nerve supply from the neck, the position and function of the vertebral segments in the upper back and any related muscle problems. As with anywhere in the body, there can be many possibilities that can be the cause of pain and dysfunction in the shoulder region, so seeing your osteopath to differentiate more serious problems is essential. Once you know that it is muscle-focused, then you know you can confidently carry on with the full Stretch for Life home program. To read more from Tim’s Blog click here. To check out Tim’s Auckland practice click here. For information about conditions that affect the Shoulders click here.